Reinvent your larger bath in a luxurious escape with the Moselle 72 in. x 35 in. x 75 in. Completely Frameless Sliding Shower Door Enclosure. With the Moselle completely frameless sliding door shower enclosure, you can achieve a luxurious showering experience in a corner space. Accentuated with either chrome or stainless steel finished hardware made, premium thick 3/8 in (10mm) ANSI-certified tempered clear glass, reversibly engineered for left or right hand installation and deluxe full-length clear seal strips to prevent leakage, this European-inspired door will add both luxury and functionality to your bath instantly. This model does not include a shower base. A modern space-saver by design, the Aston SEN973 36 in. x 36 in. neo-angle semi-frameless luxury shower enclosure defines design, functionality and quality. 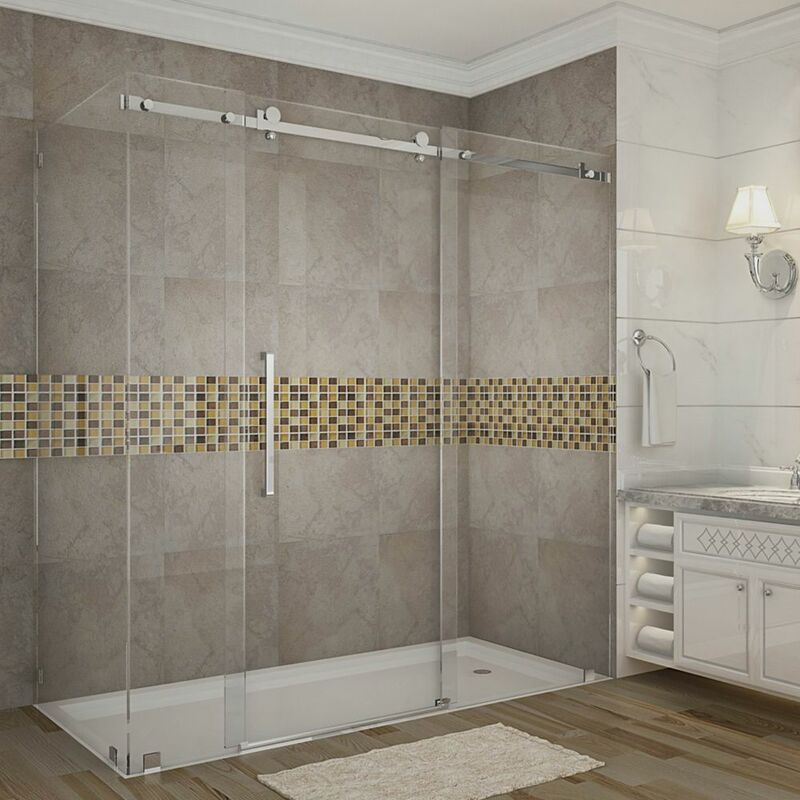 By adding a luxurious corner focal point, the premium 10 mm ANSI-certified tempered clear glass, reversible door configuration for left or right hand installation, built-in towel bar handle and choice of either chrome or stainless steel finish hardware will not go unnoticed. Make your showering experience a luxurious getaway every time with this beautiful, contemporary enclosure. This model does not include the 2.5 in. low-profile acrylic fiberglass-enforced shower base. Moselle 72-Inch x 35-Inch x 75-Inch Frameless Shower Stall with Sliding Door in Stainless Steel Reinvent your larger bath in a luxurious escape with the Moselle 72 in. x 35 in. x 75 in. Completely Frameless Sliding Shower Door Enclosure. With the Moselle completely frameless sliding door shower enclosure, you can achieve a luxurious showering experience in a corner space. Accentuated with either chrome or stainless steel finished hardware made, premium thick 3/8 in (10mm) ANSI-certified tempered clear glass, reversibly engineered for left or right hand installation and deluxe full-length clear seal strips to prevent leakage, this European-inspired door will add both luxury and functionality to your bath instantly. This model does not include a shower base.